At a blog titled "Illusion of Prosperity", which focuses on US employment and credit trends, the author has shown that for a number of metrics long term exponential growth trends have broken down since the financial crisis in 2008. Here are several that I found informative. 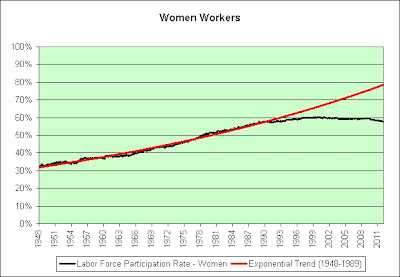 This trend breakdown is likely largely due to baby boom workers exiting the workforce. The downward trend will continue for a decade at least. This begs the question of where these men are getting the financial resources to meet their needs. Some of the drop in the participation rate is probably again reflective of boom cohort workers exiting the labor market. The answer here probably has at least two components for the recent change; boom cohort women leaving the workforce and possibly a calculation that the benefit to working is outweighed by associated costs and a poor overall labor market. 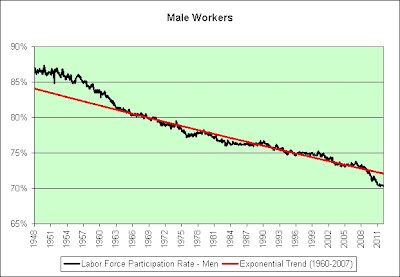 The earlier diversion from the trend line probably reflects cultural factors affecting the choice to enter the workforce. what are the age brackets for the male worker /female worker plots? 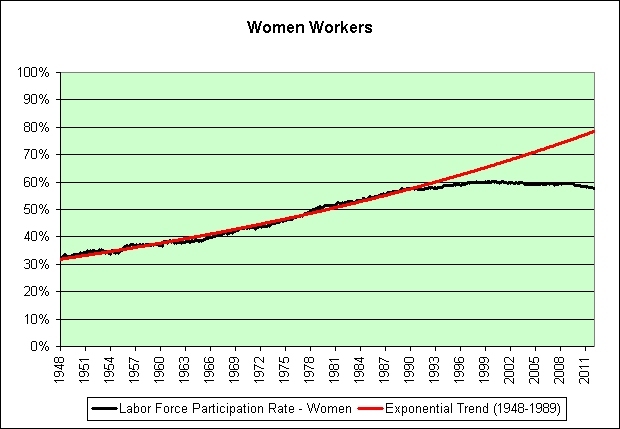 Is some of this aging of the population, or is this worker participation between 20 and 65, say? 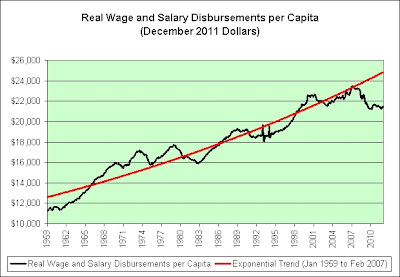 From looking at the source blog, the data source is the St. Louis Fed database, FRED. The numbers are seasonally adjusted all workers 16 and over. In the case of women some of the recent decline might be due to increased college enrolments or more time at college. That would affect men too. Where none of the statistics help is in determining the numbers of so-called discouraged workers. These are unemployed people who've decided that looking for work is a hopeless quest and have simply given up. Their numbers are, of course, a big political issue, especially with the upcoming election. The fact that the post-2008 participation drop has been much more significant for men than for women may be a hint that there aren't as many discouraged workers as some claim, unless somehow women are less prone to discouragement. Could the lower rate for women be because women get paid about 76 cents for every dollar men are paid? Less expensive workers who never made it as high up the ladder as male workers might experience a smaller lay off %/rates.